Have you been struggling to find a stockist of top quality HP M1522n MFP cartridges? We only sell cartridges that are completely compatible with your printer, and that means you won't need to stress about them causing some problems. You're not just assured of high quality toners, but you'll also get fast delivery and for free! For a store that offers really good customer care plus the most affordably priced HP laser toner cartridges, Cartridge Save is going to be the store for you. You can save cash here at Cartridge Save thanks to complimentary overnight delivery. Our company take fast delivery as very important, resulting in 98% of all orders being delivered the next day. To give you far more reassurance, any HP M1522n MFP laser printer cartridge you purchase here comes with a extensive cash-back guarantee. Whenever you are wanting to save cash, then buy with Cartridge Save. Welcome to the HP LaserJet M1522n MFP where aesthetics meet functionality. The LaserJet M1522n is a multi-functional monochrome laser system capable of printing, copying, and scanning. With a unique feature known as HP's instant-on printing, the M1522n starts printing without any warm-up time whatsoever. What is even better is that this system is also capable of generating prints at up to 24 pages per minute after it starts. A powerful 450 MHz processor powers a core capable of up to 600 x 600 dpi resolution with a 64MB internal standard memory. A wide range of compatibility options include Windows, Mac, Novell, Solaris, and even Linux operating systems making this system perfect for almost any home or small to mid-sized office. 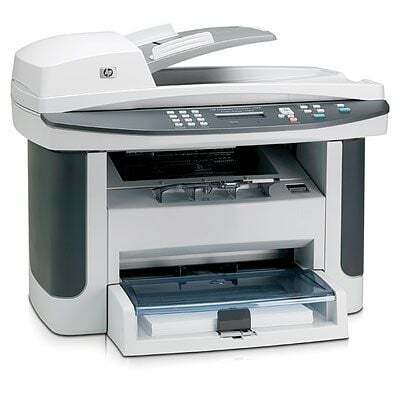 The compact and stylish HP LaserJet M1522n MFP features a grey toned colour schematic for that classic office look. The HP M1522n MFP toner cartridge system is convenient to access by simply lifting up the top portion of the system. The unit measures out around 49.5 cm wide by 40.6 cm deep x 40 cm high and weighs in at only 11 kg making it a perfect fit and weight for most office desktops. The LaserJet M1522n MFP comes equipped with a two-line, 16 character, 6.35cm LCD text display for easy user system maintenance and configuration. Hewlett Packard's LaserJet M1522n MFP is designed to multi-task giving users the option to speed through projects by performing tasks such as printing while scanning. This system can be connected locally via parallel port but also has USB 2.0 and Ethernet connections for networking capabilities. The M1522n MFP's setup software is partitioned into two sub-categories for ease of installation, users can customise the setups for just USB or just network functionality. The LaserJet M1522n has a relatively low monthly duty cycle at 8,000 pages per month, making it unsuitable for larger print jobs on a regular basis. The HP M1522n MFP toners do not have a high-yield option, leaving standard yield capacities at 2,000 pages per use. The system's memory cannot be upgraded from the standard 64 MB of RAM that comes with it.